It's just over a year since I have taken a broadband connection with MTNL Mumbai and apart from the initial delay in installation, I am an extremely happy customer. Over the last 5 years, I have sampled several service providers across home and workplace - Tikona, Tata Indicom Broadband, Reliance Broadband, Airtel etc. One of the first posts I made in this blog was about email as the best way to get customer complaints addressed compared to helpline. This holds especially true of MTNL also. "Extract of TRAI notification dated 6.10.2006 for QOS of Broadband Services - "keeping the reasonable loading level in intra-network links upto ISP Node, the benchmark has been prescribed that service providers shall ensure the speed of Broadband connection is greater than 80% of the subscribed speed". I sent across a mail to MTNL citing the problem and received an acknowledgement that they would follow up. I also dropped into my local exchange to chat up and understand the reason for the problem. By luck, I found a very friendly officer who explained to me that speed is controlled (for Mumbai) from Prabhadevi exchange. The local exchange comes into the picture only if the line is unstable. However, he made a call himeslf to follow up on my complaint and asked me to check my speeds again in 2-3 hours time. I switched off my router and did the speedtest. As you can see, the speeds are back :) and it just took a few hours for them to fix it. So if you have a genuine (Non-torrent related :) speed problem, I can tell you from my experience that MTNL does address it promptly. 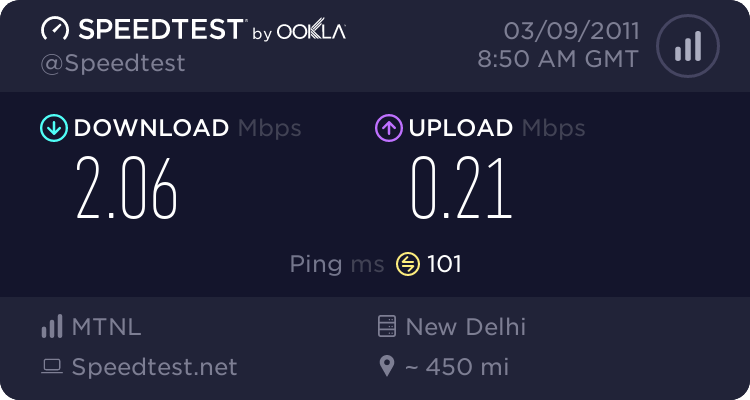 I have not had a speed issue with any of the private providers but each had a different problem (with Tata Indicom it was frequent downtime. With Reliance and Tikona it was billing. Airtel is very good but they do not have a broadband footprint where I live. Besides, MTNL prepaid rates give me one of the economical net connections around. I don't see myself switching to anyone else in the near future! but the fact that you needed to complain , doen'st itself speak of the laggard nature of mtnl. there'll be so many ppl who are experiencing low speeds, so should they all drop by local xchange?? Will India benefit from reduced iPad 1 prices?